Brachiopod fossil; photo by lvanvlee8 on Flickr (noncommercial use permitted with attribution / share alike). 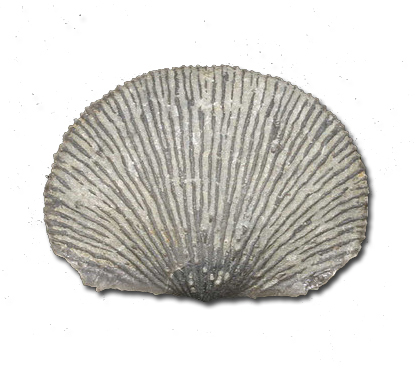 Fossilized brachipods were once the shells of marine animals of the Paleozoic era (the Paleozoic era was from about 542 to 251 million years ago). Because the state was covered by ocean water in prehistoric times, hundreds of different types of brachiopods can be found in rocks throughout Kentucky (most of these species are now extinct). Though similar in appearance, brachipods are not related to molluscs (bivalves such as clams). There are about 300 species of brachiopods living in today's oceans.